Anheuser-Busch’s Budweiser has been the self-proclaimed “king of beers” for decades, shipping a whopping 50 million barrels a year at its peak of popularity in 1988. 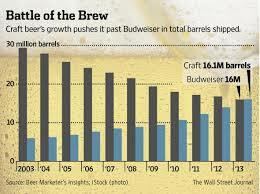 According to the Wall Street Journal, Budweiser’s popularity has sunk, and shipped 16 million barrels in 2013. It’s a significant number because craft beer shipments totaled 16.1 million barrels that same year. Sure, that’s every single craft beer in the market, versus a single brand, but beer pundits (yes, there is such a thing as a beer pundit) see this as a significant shift in the market. According to the WSJ article, Budweiser has lost appeal in the youngest (legal) beer drinking demographic. Anheuser Busch estimates 44% of 21-27 year old drinkers have never even tried Budweiser. That’s shocking, considering how ubiquitous Bud was just a few years ago. Budweiser hasn’t actually been the “King of Beers” since 2000, when it was toppled by its younger, lighter brother, Bud Light as the number one selling beer in the country. Coors Light is the second best selling beer. All craft beers produced in the U.S. own a 7% share of the market, just slightly more than the percentage of the market that Budweiser claims.